This recipe was delivered to my email in the morning and by 6:30 that night I was serving it to Nancy Lee and two very special dinner guests. There was something in the description about this being “astoundingly simple to make” that made it impossible NOT to attempt. Not only that, but anything that’s “scented with vanilla bean and light rum” just has to be good, doesn’t it? There were four of us around the table. This recipe is for six ramekins. We’d have leftovers. Actually, we didn’t. Enjoy! Heat oven to 300°. In a bowl, whisk together sugar, salt, eggs, and vanilla. Whisk in the cream and the rum. Transfer mixture to a 3-quart baking dish or 6 individual ramekins; set inside a roasting pan. Put the roasting pan on an oven rack postioned in the middle; pour boiling water into pan to come halfway up sides of dish. Bake until slightly loose in center, 40–50 minutes. Remove dish from pan; chill until set. 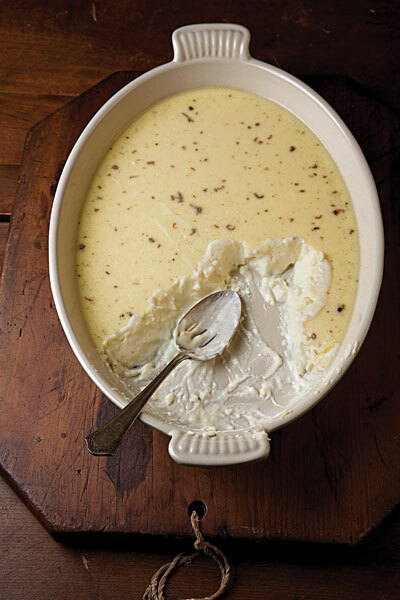 Take this custard out of the refrigerator about 10 minutes before serving.